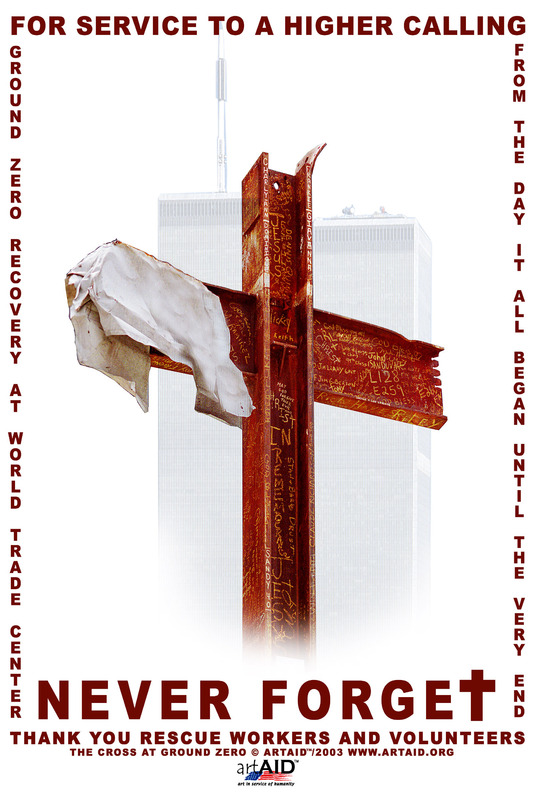 The potential use of the cross in the World Trade Center Memorial has been controversial. Many groups such as families of the victims want the cross to be included, while other organizations, notably American Atheists and the Coalition for Jewish Concerns, disagree. The newly formed American Atheists led by founder Maldalyn Murray O’Hair in 1963 succeeded in banning prayer in public schools (Murray vs Curlett). She filed suit against NASA and lost. The issue was over Apollo 8 astronauts broadcasting the first 10 versus of Genesis from lunar orbit to the world on Christmas Eve. “For the people on earth, the crew of Apollo 8 has a message we would like to send you” said Anders just before they slipped behind the moon, in what to date was the most watched television broadcast to date: “In the beginning, God created the heaven and the earth…”. In the 1960’s, Rev. James Stout was under contract with NASA to coordinate 13 chaplains at the manned spacecraft center in Houston. The Apollo Prayer League was an important support to the Apollo program. Within a month after being formed, the League had 50,000 members, and soon there were prayer groups around the world. One of the projects of the Apollo Prayer League was to put a Bible on the moon. They succeeded but it took many attempts. Frank Borman was supposed to read this in his church congregation that night but his space mission kept him away. I find this prayer relevant to today’s troubles. Especially in Christian remorse of a crazy man’s killing rampage in Norway that stunned the world. Did you know Buzz Aldrin performed Holy Communion privately from the lunar module while on the moon? The gravity of the moon is 1/6th that of earth. Buzz said the wine curled slowly and gracefully up the side of the cup. Apollo astronauts were allowed 6 ounces of personal gear to take to the moon. He used his allowance to practice his faith. Aldrin later said: “It’s interesting that the first liquid ever poured on the moon, and the first food ever eaten there, were communion elements”. Did you know that a red covered Bible was left on the dashboard of a lunar rover? It was Apollo 17, the last time men traveled to the moon. The lunar rover was the third vehicle to roll on the moon. It weighed 463 pounds and could carry 2 astronauts plus 1,000 pounds of rocks. Although the astronauts drove about 4 miles on the moon, it was capable of a 50 mile range. Paraffin, the substance of bees wax helped cool its batteries. The rovers were stored under the lunar lander until needed. Did you know that duct tape could not repair a broken fender on the moon? Besides a full size Bible left on the moon, about a hundred were brought in micro-film form and returned to earth. These were serialized by the Apollo Prayer League and distributed to a wide range of recipients, including Bob Hope and George Bush. A replica has been installed at the gravesite of Father Mychal Judge, a New York Fire Department chaplain who was killed in the collapse of WTC 1 on September 11. Other surviving crossbeams were salvaged from the rubble; one was given to a Far Rockaway, New York chapter of the Knights of Columbus in 2004. Another replica cross was fashioned by ironworkers from Trade Center steel and installed at Graymoor, the Upper West Side headquarters of the Society of the Atonement, a religious order of Franciscan friars. The issue is that the atheists don’t want this “chance formation of the cross” in the 9/11 Museum. Does that mean the Metropolitan Museum of Art must remove all of the Religious paintings of notable artists down through the ages? That would be a very large portion of the Met in poor shambles. That would have to include the section on Greek Pagan Gods, that is religious too! This lawsuit is not a lawsuit on a Museum piece as is stated, it IS an attack on Christianity, and in my opinion all religions. 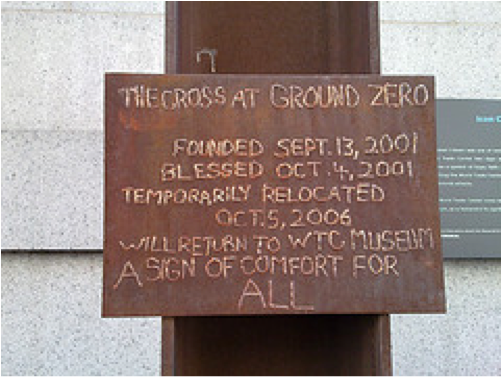 As an art restorer in my past, I can say that the 9/11 Cross is being blocked from Ground Zero Museum! Museums preserves history. Yes the Cross may be religious, but it is still part of the history. Fr Judge was highly regarded by the firemen. He was the Firemen’s Friar. He remained with the firemen in the Towers, until their death. The Firemen who survived gave Fr Mychal Judge “Victim 0001″. Fr Judge and the Firemen were able to be courageous because of their belief in the Truth of the Cross. Whether one believes in it or not does not matter, that IS part of the history, and it is still part of our culture.